Author Written by Velmurugan Saravanavelu and last updated on Posted on October 16, 2017 . Let’s start this tutorial with understanding what is SAP Work Centers. A Work Center can be a place or a machine or a labor where production operations/activities are performed. 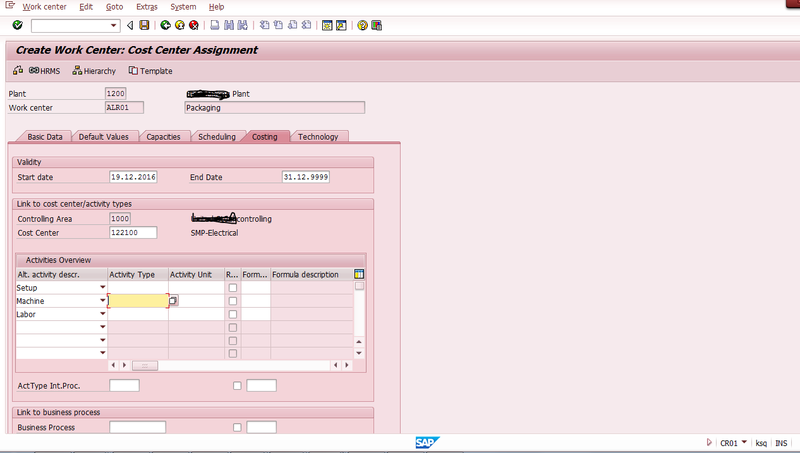 In SAP PP, Work Center is used in routing operations and production orders. Work centers also used in other applications (SAP modules) like Plant Maintenance, Project System, and Quality Management. 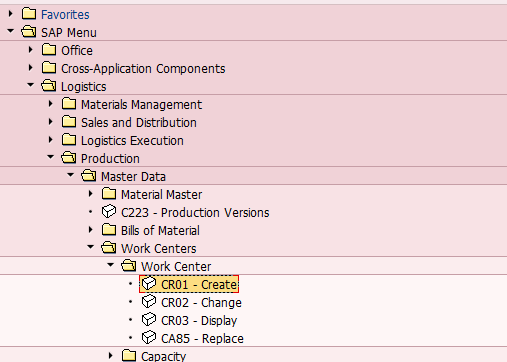 The goal of this tutorial is to explain basics of work centers in SAP PP. First, it is necessary to understand what are the functions of work centers in SAP and why do we need them. Capacity formula. Capacity formula uses standard value key parameters (maintained on the Basic data screen of SAP Work Centers transaction). Operation time in a production order. 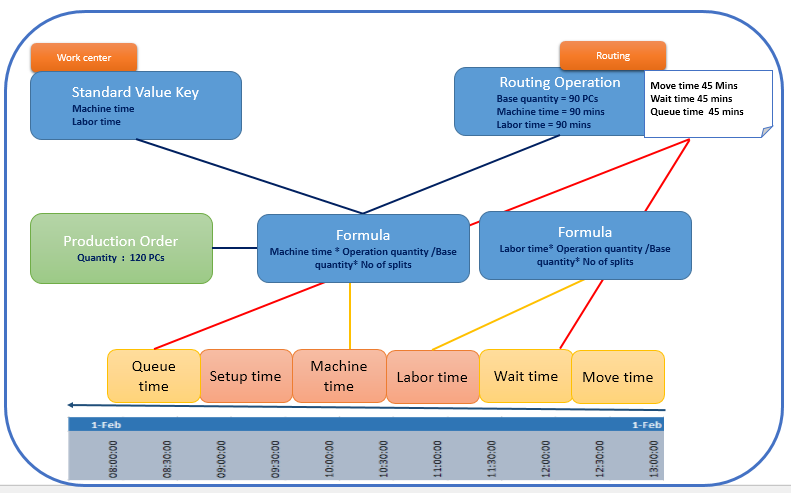 This uses time defined in routing operation for base quantity. There is also a concept of the number of individual capacities. This is the number of individual machines available with similar capacity. When the SAP system calculates required capacity it divides the number individual capacities in a formula and when calculates available capacity it multiplies the number of individual capacities. Formula for scheduling in work center scheduling view. Requirement date/time from an order. Inter-operation times (i.e. queue time, wait time, move time, etc.) from routing. The SAP system do backward scheduling starting from the requirement date/time in order to schedule the order. Here queue time, wait time and move time are known as “inter-operation times”. Time raw material/components need to wait before processing in a machine. Time material must wait after processing in a work center. Time required for material move to next work center for further processing. 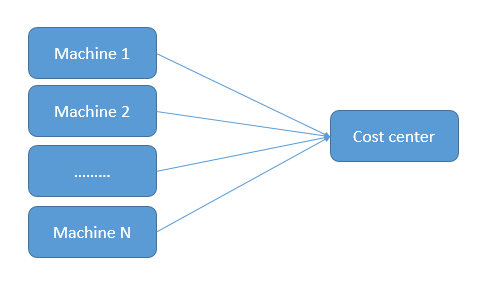 Costing formula in a work center. 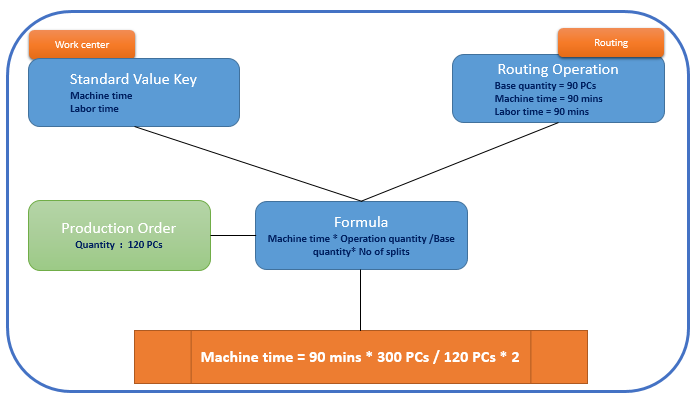 Operation time in a routing and an order. 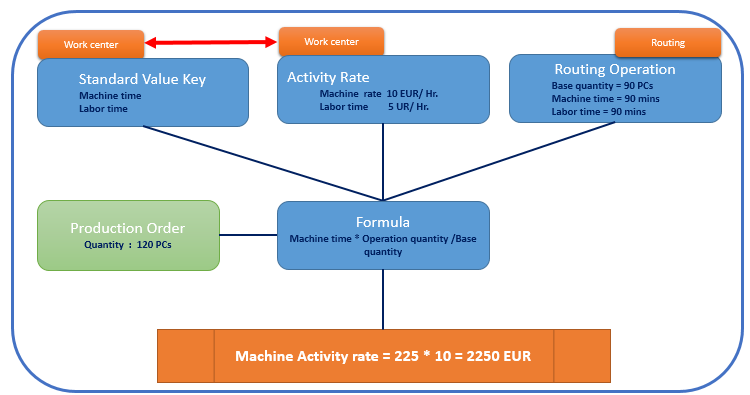 Activity rate defined for the cost center which is assigned to the work center. How to Create SAP Work Centers? By directly starting the transaction CR01. The system will show you the initial screen of the create work center transaction. Let’s discuss these screens in more details. Location in which the work center is assigned. This is used for Plant Maintenance purpose. Area in which raw material need to be moved for operation. Work center usage field control application or function area where it is used. 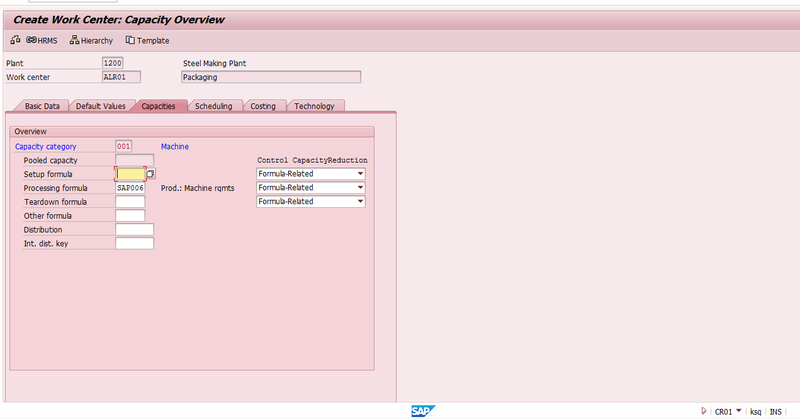 Backflush in SAP is automatic posting of raw materials/components when production activity is confirmed. When we confirm an operation/work center for an order, BOM components that are assigned with that particular operation/work centers (in routing) will be posted automatically. 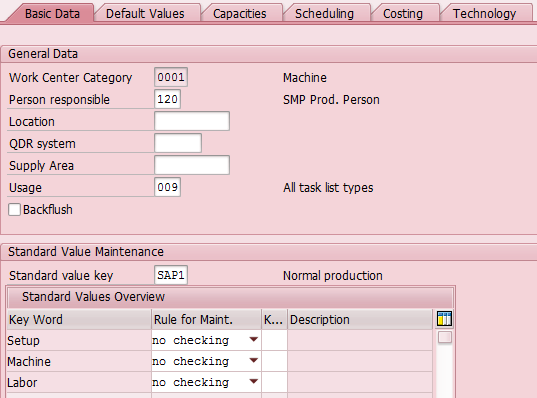 SAP calculates capacity, scheduling and costing using these parameters defined in the formulas. Let’s say, I have defined the following standard value key and its parameters. Operation quantity is defined in an order and base quantity is defined in a routing. 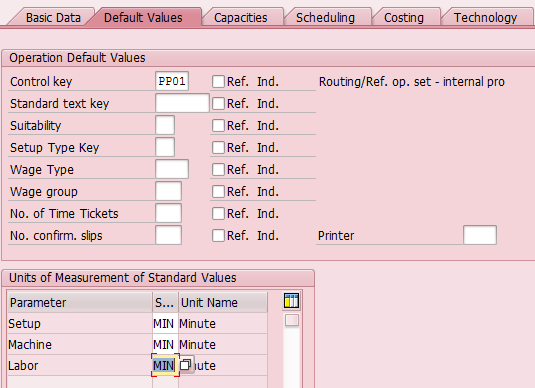 Fields appearing in this screen are used as default values in routing which reduces the time required to enter values in routing. When a user enters machine time for this work center in routing as 100, the unit of measure will come automatically as MIN (copied from work center data). Similarly, when you enter this work center in routing for a particular operation, the SAP system will automatically copy the control key from the work center. Furthermore, if Reference Indicator is activated, values from the work center will be copied and cannot be changed in routing. If we don’t want these default values to be copied to routing, no need to enter any values on this screen. For the work center Lathe we have maintained control key PP01. Let’s say this work center is used in different products. If you don’t want to use PP01 for all the products, do not activate Reference Indicator. This will be explained in details in our next tutorial. Inter-operation times like move time, wait time, etc. In the costing screen, SAP work center will be assigned to a cost center. Each cost center will have activity types and formulas to calculate cost of activities. 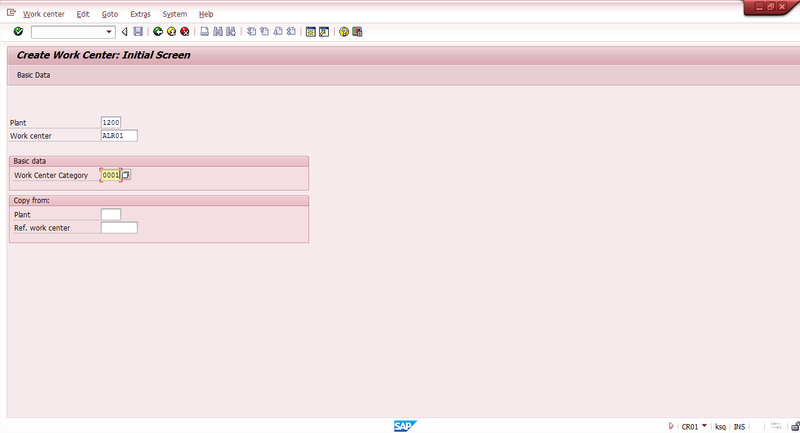 This will be explained in more details in one of the next tutorials of SAP PP Training Course. Assignment of a work center and a cost center can be N to 1. It means that several work centers can be assigned to the same cost center but only one cost center can be assigned to a work center.